People often wonder whether art therapists make art alongside their clients in session. 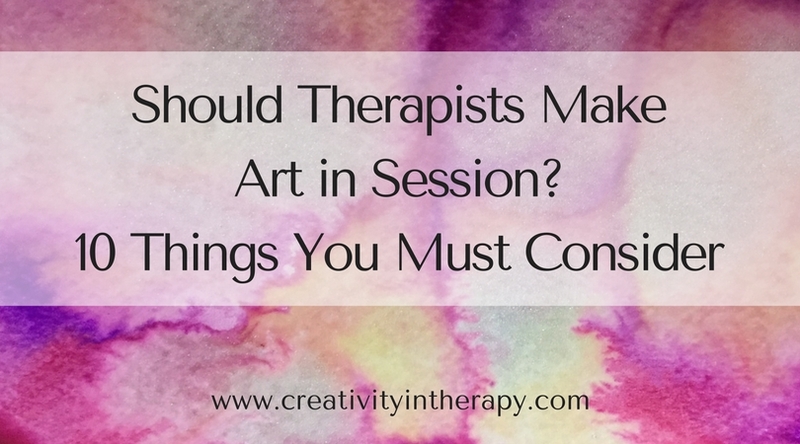 I think this is an important issue to explore further, so I’d like to share some of my thoughts about whether therapists should ever make art in session. If you are a play therapist, counselor, or other psychotherapist that uses art in therapy, it is important to understand why you typically should not make art along with the client…and when the exceptions to that might be. 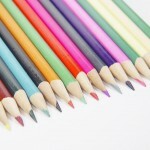 If you are a trained art therapist, you have likely considered this question a lot. I’d be interested to hear your thoughts and whether you ever make art in session. So, should the therapist make art in the therapy session? 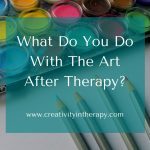 The short answer is no – in a typical art therapy session, the art therapist will not make art with the client. The reason for this is that it’s essential for the therapist to be present as a witness to the client’s artistic process. 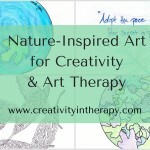 Witnessing the art-making is part of the healing relationship provided by the therapist. 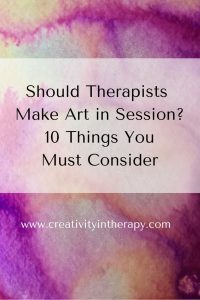 However, as with most things in therapy, sometimes the answer is “it depends.” Here are some of the things the therapist – whether an “art therapist” or ‘therapist using art” – should consider. I’ll explore each one below in more depth from my perspective and experience. As I mentioned above, much of the healing in art therapy comes from this aspect of the therapist as witness to the art, which does not really happen if the therapist is making their own art. Having the witnessing presence of the therapist is a big part of what makes art in therapy different from just doing art at home on one’s own. It can be a powerful experience for a client to have the undivided attention of the therapist. In addition, by carefully observing the therapist gathers a lot of information from the non-verbal art process – I see the hesitation or confidence with the materials, reactions and facial expressions as the client works, things that they start to do before changing their mind, and changes that the art piece goes through as it develops. This information is just as important – and often even more important – than what the final art piece looks like. Even if you do have a reason to make art in the therapy session, make sure you are putting most of your energy into observing the client’s process. Many clients are going to have anxious thoughts about their art and their own artistic ability. This could be triggered even more by comparing their own artwork to that of the therapist. As they become more focused on comparing themselves and judging their artwork, they will be less engaged in true creativity and self-expression. If I do decide to make art with a client, I keep my art simple and non-threatening, maybe matching the client’s style or ability level. 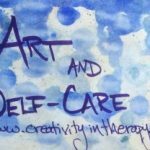 When I introduce clients to art therapy for the first time, I always try to help them understand that there is no “right” way to do art or to respond to a particular directive. Creative and personal expression is the most important thing. However, I still have clients that wonder if they are doing something the right way in art therapy. Most therapists have probably had experiences of talking to clients who want to say the right thing or give the therapist the answer that they want to hear. Making art can be a very immersive experience – that’s part of what can make it so relaxing and helpful. 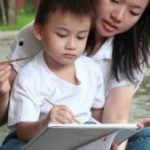 When the therapist engages in their own art-making in session, they risk being distracted and not focusing enough on what the client is doing. You might miss some non-verbal signal from the client that you should respond to in the moment or that would have been important to explore further after the art is done. You also risk hurting the client as they may wonder why you are not paying attention or if they perceive you as distracted. In all types of therapy, the therapist’s role is generally to listen, witness, and understand, while the client’s role is to share and express themselves. All therapists learn that it’s essential that the therapy process be about the client, not the therapist. Most therapists think about this when they are considering self-disclosure – are you sharing something for your own benefit or for the good of the client? This same dynamic applies to the art process. If you are considering making art in session, always consider whether it’s really for the benefit of the client. Also keep in mind that making art together may signal a relationship of equality or friendship, which may muddle therapeutic boundaries for some clients. When do I make art with clients? There are times that clients are very self-conscious about being “watched” as they make art. They are so worried about what the therapist is thinking that they have trouble engaging in the process. I have found that doing some simple art alongside them or doing something else, like cutting out collage images as they work, can allow me to still observe without the client feeling as nervous. I generally find this happens more with kids and teenagers, usually in the first few sessions. While adults can also be self-conscious, they are more able to talk about and process this discomfort. After a couple of experiences of making art, clients – both children and adults – tend to get more comfortable with being observed and having the therapist present as witness. 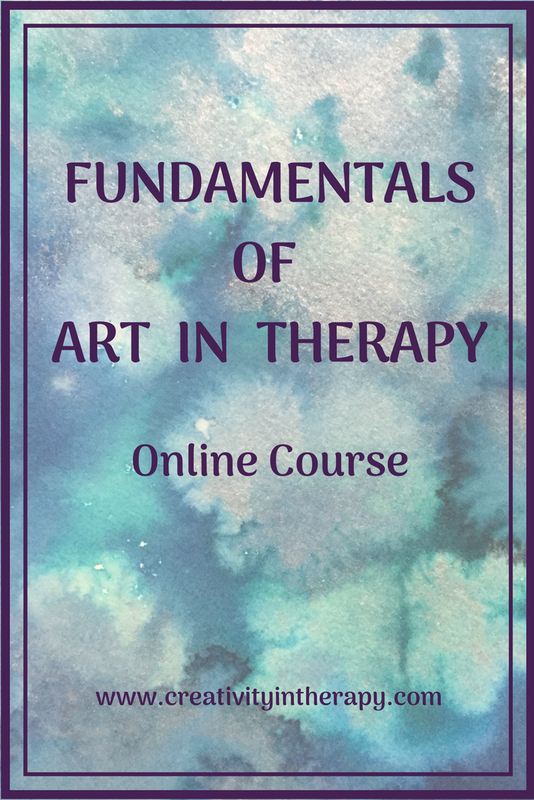 Although art in therapy is not the same as an art class, there may be times that the therapist will teach clients different techniques or how to use art materials. I will often allow clients to experiment first with the media, but then show a few examples of different things to do. Clients will sometimes want more information about how to do use a material, ask how they can achieve a certain effect, or mention that they have always wanted to learn how to do something particular in art. By demonstrating and teaching, the art therapist can help the client to build a sense of mastery and challenge themselves to try something new. Sometimes I will also use samples of art techniques that I have previously completed, to help the client get a sense of possibilities. For example, when I do mandalas with clients I often share a few examples of different types – structured/patterned mandalas, free form and unstructured, asymmetrical, mixed media, etc. This helps clients to expand their idea of what is possible beyond the intricate (and often impossible to achieve) patterned mandalas that they are more familiar with. Sometimes I will make art alongside a client to model a different way of engaging and being. The client can see another way of making-art, but not have as much pressure to change as a direct suggestion would be. For example, if a client is very perfectionistic and detailed and I think it would benefit them to be able to loosen up more or make mistakes, I might model this in my own art. For clients who are stuck in kinetic/sensory art-making, the therapist may model the transition to more expressive or representational art, gently helping the client to consider a change. Be careful of assuming that a different way of approaching the art is better or necessary for the client. Sometimes clients need to be able to spend time in their normal way of approaching things and the therapist needs to meet them where they are, not push for change. Sometimes mirroring can more helpful than modeling something different. 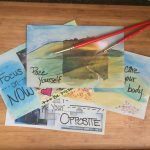 When a client is interested in playing with art materials but not engaging well with the therapist, mirroring what the client is doing can help build that bridge. I have used this most often with kids or teens who just want to sit and play with kinetic sand*, squish clay, or do coloring pages, but aren’t ready to talk or do more expressive art. There are times that clients need more than a demonstration of a technique, they need assistance with their actual art piece. This can be a helpful thing for the therapist to do, but needs to be done carefully. Assisting the client with their art should always be done with the most minimal intervention possible and in a way that helps the client be empowered. Some clients can get overly focused on having the therapist help them with their art, and the process reinforces their internal belief that they are not good enough at art. The goal of assistance should always be to eventually remove the therapist’s participation in the art, not to enable dependence. I see this request most often with children who don’t know how to draw, make, or paint something that they want to do, but it can come up with adults as well. In this case, I try to take a scaffolding or teaching approach instead of just doing it for them. We may look up directions together of how to do something, or I may lightly sketch the problem area and then encourage the client to draw over it and continue for themselves. With some clients who ask often for help or “can you do it for me,” I will use a turn-taking approach – I do one small part and then they do a part, going back and forth until the artwork is complete (with the client being the leader and idea-generator at all times). Intentional joint art between the client and therapist can also have its place in therapy when considered carefully. 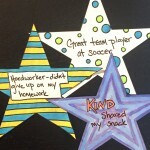 I have used joint art with kids and teens as a way to explore communication, boundaries, and social skills. 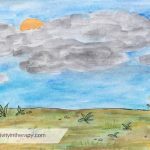 I sometimes join in an art activity whose purpose is to teach something new – like making feelings faces collages or doing a social story together – because the client needs my input to learn the new skill. Joint art activities can also be a way to engage client that are otherwise reluctant to use the art materials. The “scribble chase” activity is a popular activity that involves the therapist and client taking turns “chasing” each other’s markers around the page. I also use joint art sometimes as a termination activity, creating a joint picture that they can take home with them at the end of treatment. When client’s benefit from joint art, it can also be important to think about whether there is someone else in the client’s life (besides the therapist) that could engage in this process with them. For kids and teens, it can be a very powerful experience to have a parent make art with them and be able to provide support, encouragement, focused attention, and positive connection. 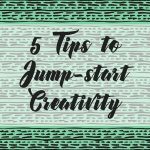 I hope these thoughts help you in your own considerations of whether to make art in session with clients. Every therapist will approach this issue slightly differently as they are informed by their training, experiences, and personal style, but it should always be considered mindfully and with good clinical judgment for the best interest of the client. Share your thoughts below! Do you ever make art in client sessions? Did I miss a reason for or against it? Completely agree with you. It must be client led. I always make sure if I am doing anything alongside my clients that it is different art so they cannot compare.